Today, 19 June 2010, Nobel Peace Prize Laureate - Aung San Suu Kyi turns 65 years old under house arrest in Myanmar (Burma). Today, freedom advocates and human rights activists worldwide join prisoner of conscience - Aung San Suu Kyi, to celebrate her 65th anniversary - by holding protests - calling for the unconditional release of Myanmar's "symbol of freedom" - Aung San Suu Kyi. In commemoration of her birthday, world leaders have called on the repressive military regime of Myanmar to release Aung San Suu Kyi and all other political prisoners, unconditionally. According to the BBC, Ban Ki-moon, U.N Secretary General said, amongst other things: "I'm deeply concerned that she is still under house arrest without being released..."
President of the United States - Barack Obama, said in a statement: "I once again call on the Burmese government to release Aung San Suu Kyi and all political prisoners immediately and unconditionally, and to allow them to build a more stable, prosperous Burma that respects the rights of all its citizens." Since 1990, Aung San Suu Kyi's right to freedom and liberty of person has been repeatedly denied. This tale of political persecution started when Aung San Suu Kyi's political party - National League for Democracy (NLD) - sought to challenge Myanmar's repressive military regime and won the 1990 general election. Despite the landslide victory, NLD was not allowed by the military regime to form a democratic government in Myanmar - where political activists face persecution. As of today, NLD is not recognised as an official political party, and its leader - Aung San Suu Kyi has been barred from participating in elections in Myanmar. Amnesty International holds that the military junta has ruled Myanmar with an iron fist since 1962. The repressive regime has imprisoned over 2,100 political prisoners who dare to challenge the status quo. Aung San Suu Kyi - a prisoner of conscience - turns 65 years old under house arrest. Her civil, political and fundamental human rights have been consistently violated by the government of Myanmar. She remains a beacon of democracy and fundamental freedoms in Myanmar and beyond. She should be released and allowed to particiapte in the upcoming political elections in Myanmar. It is worth mentioning that Aung San Suu Kyi was awarded the Nobel Peace Prize in 1991. She also has many other human rights awards on her shelf. 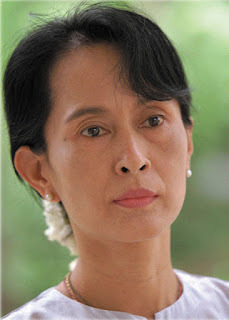 Like Nelson Mandela of South Africa, she represents non-violence in the fight against an oppressive regime in Myanmar.